Model TR, 240 or 208 volts is for use by up to 6 people full time. Replacement parts and accessories are always in stock; if you don’t find what you’re looking for, or have any questions, please call us at (214) 358-4238 or toll-free at1-800-527-5551. well packaged no damage from shipper ups. high quality welds correct finish grade on stainless steel surface;very satisfied with purchase will use #10 3 wire orange grade from home depot since pulling 3600 watts. #12 is not recommended by an election . which is yellow wire for 1800 watts or less.grounding is most important also. and a 20 amp breaker. the soft foam fit packing works great absorbing delivery shock and bounces.well thought of then most companies would do for product shipment. will hook toilet up end of april .cant wait. We purchased the TR model in 2013 and installed it in our cabin on July 4th – we are now Independent from the use of the Privy! A great product and the installation was very easy! Now we can use the facilities indoors during the winter instead of the cold privy! I purchased the TR model for our woodshop, as we didn’t want to mess with plumbing or septic issues. The installation was very simple, both electrical and exhaust were straight-forward. It works well after roughly 1-1/2 years – I would recommend for use in any type of remote location where a typical toilet wouldn’t work. Have had this TR model in my hangar for 2 years now. a great unit save time and money. going to buy one more for my new hangar soon. This was a replacement for the Incinolet at our lake cottage. We used the first for more than 30 years, with a few fan and wiring replacements. We are happy with the simplified switch (replacing the timer knob) and the 240 V cord (replacing the need for hard wiring). We look forward to at least another 30 years. Just installed this weekend in our hunting property. Easy installation. Well- packaged unit arrived with no damage. Works great. No odor, smoke or issues. Glad we went this route vs composting toilet. I’ve owned mine for 6 years. It sits in my barn and has made a huge difference for me and my clients. I’m situated right next to a wetlands so a septic system is simply not practice. We’ve replaced the blower once. Much easier to keep clean than a composting toilet. I have a cottage on an island. This product is terrific. Installation was a breeze after the electrician set up wiring. It is clean, efficient with no odor. Far better than a composting toilet and I wish I had purchased it 9 years ago! 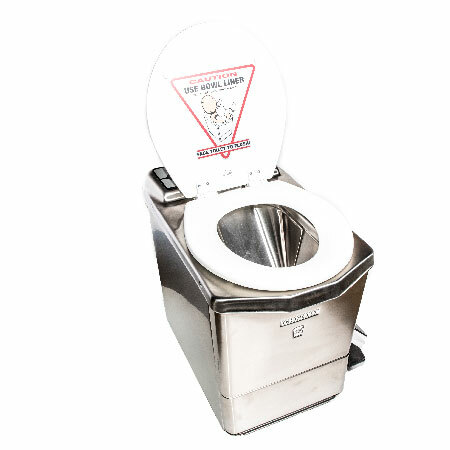 We have used our Incinolet Model TR for many years – maybe 10 to 15 (lost track). Anyway – the thing works like a champ. We have a cabin on the shores of Lake Superior – out on a rocky promontory where there is NO chance of installing a septic system. We have one of these – and so do 4 of our neighbors. They are the perfect solution for dealing with waste in a eco-friendly and convenient manner. Yes – they use electricity and leave a carbon footprint in doing so – but that’s a better footprint than the footprint left by alternative watse disposal methods in our situation. It’s clean, odor-free, reliable, and (best of all) indoors. The alternatives aren’t so good – perhaps non-existent. Also – the company is great to work with. Incinolet has really helpful staff when it comes to questions and troubleshooting (although I’ve maybe called twice in all the time we’ve owned out Incinolet), and a prompt response to any parts replacement and “re-usable” (liners, etc.) orders. If you sense this product might be a good fit for your needs – don’t hesitate to place an order. They both use about the same amount of power. The CF model takes longer for the heater to reach its max temp than the TR so on the TR the heater starts cycling on and off sooner. They both are set at the same time because the TR is made for more people. The toilet seat will not get hot while it is running. If you call us up we can help you understand how the operation of the toilet works. Please call us this toilet sounds like it was damaged in shipping. interested for a rv..How much electrity or lp will each toilet use?